A blitz is something crazy, it’s something that can cause panic and change the order of things like maybe a little bit of organized chaos. A blitz can also change things for the better, like in football, whereas someone doesn’t expect a certain something to happen from you and their absolutely excited about it. Thing’s in life happen a lot whether it’s good, bad or somewhere in between. We won’t know what kind of ‘blitz’ it will be until we face it head on. That’s exactly like this book. Jeff Kemp does an excellent job discussing the ‘blitz’ play of football and how it relates to our personal lives, where it’s a turn for the worse, or maybe just something that’s unexpected but it turns out to be something amazing later on down the road. He gives key examples from his own life, which definitely helped me to connect more with the book, and describes how he turns the blitzes of our lives into something victorious. Kind of like the time in the bible where the Israelites were facing off against the Philistines and this super tall guy named Goliath came out to fight, and the Israelites were scared. I’d say that would be a blitz right there. Then David, who isn’t nearly as tall as Goliath shows up, and he faces the giant, defeating him in the end. See, a blitz we go through in life might seem rough at the start, but give it time and who knows what might happen next. Jeff explanations of things were easy enough for anyone to read, and anyone whose facing things in life to try and change them for the better. Though there might be some situations that might be a little different, who knows. There’s a lot of key elements that I’ll be reminding myself of time and time again because they are so important in travelling this road that we call life. I definitely give this book a 4 out of 5. 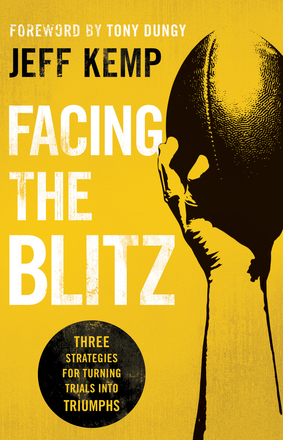 The book is absolutely amazing, anyone going through anything(Which is probably all of us) should read this, to help us grow when we start facing difficult ‘blitzes that come our way. The only reason I’m giving it a 4 is that I was provided this as an e-book for reviewing purposes and it was missing possibly about 4 chapters, Don’t take that as saying, I don’t want missing chapters. Don’t do that, just go and read this book and watch how it can transform your life. Jeff Kemp quarterbacked in the NFL for eleven years, playing for the Rams, the 49ers, the Seahawks, and the Eagles. He and his father, Jack Kemp, were the first father-son quarterbacks in NFL history. Today Jeff speaks at community events, churches, men’s and marriage conferences, business conferences, and prayer breakfasts. Jeff and his wife, Stacy, live in Little Rock, Arkansas.